Everest Base Camp is one of the most popular adventure treks in the world. 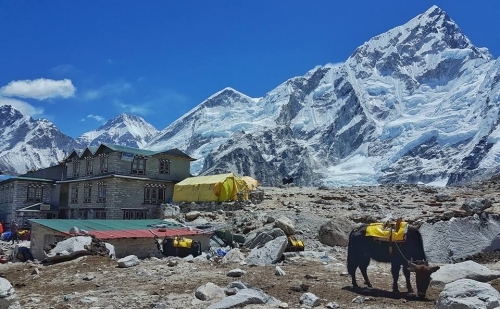 The Everest Base Camp Trek offers spectacular views of the highest mountain peak in the world, Mount Everest, and many other snow-capped Himalayan mountains. Mount Everest, with its peerless height of 8848 m, has its own charm which allures trekker to witness its beautiful icy faces, and climbers to scale its glorious height. For this reason, Everest Base Camp has become one of the most popular trekking destinations in the world. We begin the Everest Base Camp trek with a scenic flight to Lukla from Kathmandu. On reaching Lukla, we follow the trekking trail to the famous Sherpa village of Namche Bazaar and on the Buddhist Monastery of Tyangboche, a place of serenity that also enjoys some splendid views of highest mountains, including Mount Everest (8848 m), Mount Lhotse (8501 m), Mount Cho Oyu (8153 m), Mount Makalu (8463 m) and Mount Ama Dablam (6856 m) among others. During the Everest Base Camp trek, our trail passes through many glaciers, to finally reach the foot of Mount Everest, which will be one of the most memorable experiences of your life. 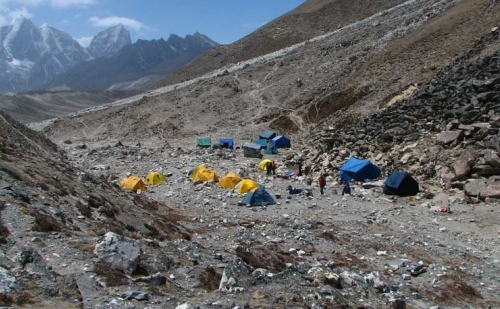 The Everest Base Camp trek is considered moderately difficult and adventurous. If you are physically fit and have a good sense of adventure, you will definitely enjoy the it. Our Everest Base Camp itinerary is designed to acclimatize you gradually so you do not have to worry about any altitude sickness. But, we request you to check your altitude fitness and the designed itinerary prior to the trip to Everest Base Camp. 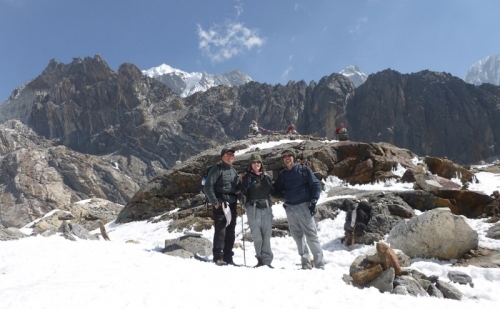 We have specialized in the Everest Base Camp trek in Nepal since the day of our inception. And we offer the trek with the best prices and services. Our Everest Base Camp trekking package is the most purchased one among treks offered by Green Valley Nepal, and it has always been one of the best deals for trekkers as well. Green Valley Nepal has designed the Everest Base Camp itinerary with tea house and lodge accommodation. 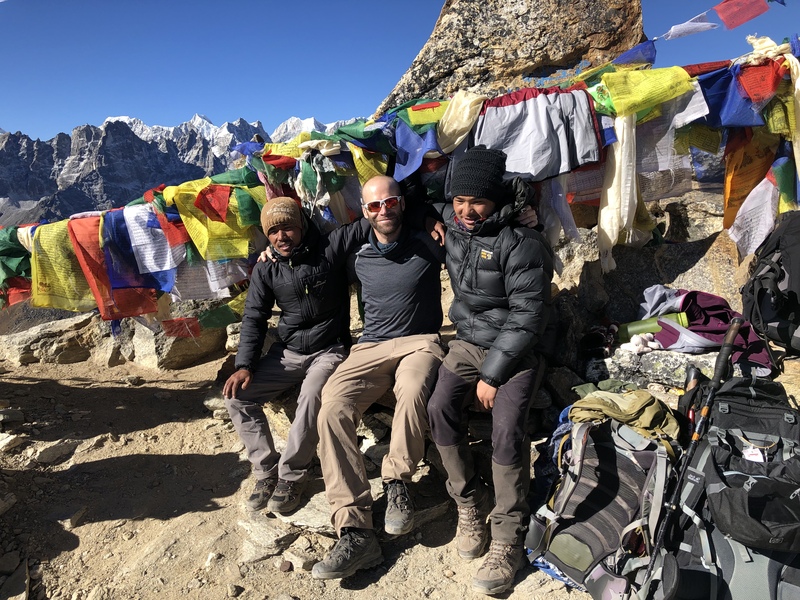 We have a team of expert professional Sherpa trekking guides and porters to guide you throughout the trip and handle everything while understanding your overall needs and interests during your Everest Base Camp trek. Day 1 :Flight from Kathmandu to Lukla and trek to Phakding 3-4 hoursAfter having breakfast in the morning, we get transferred to the domestic terminal of the Kathmandu Domestic Airport to catch our scheduled morning flight to Lukla. Lukla is the starting point of Everest Base Camp Trekking. After an adventurous 30 minute scenic flight above the breathtaking green and white Himalayas, we land on the Tenzing-Hillary Airport at Lukla. Then we meet our porters and other crew members and start Everest Base Camp Trekking, after some packing arrangements. After a few hours of walk, we reach Phakding. We only have a short hike today to assist the proper acclimatization. However, if you are interested, you can also take a side trip to a nearby monastery. We stay overnight at local guesthouse. Day 2 :Trek from Phakding to Namche Bazaar (3440m) 4-5 hoursThis is the second day of your Everest Base Camp Trek. Today, we walk through a beautiful forest of pine. The walk leads us along the bank of the Dudhi Koshi River through many suspension bridges. Hillary Suspension Bridge is one of the famous suspension bridges we will be crossing today. En route, we witness the wonderful views of Mount Thamserku (6618m). We pass through the settlement of Benkar and Monjo and eventually arrive at the check post and entrance to Sagarmatha National Park. Before reaching Namche, we also pass through the last village of Jorsale. Our trail further ascends through the forests and bridges until we reach the confluence of the Dudh Koshi and Bhote Koshi Rivers. We get the first sight of Mount Everest over the Lhotse and Nuptse ridge just after a final steep ascent for about two hours. To reach Namche, we still have to walk for about an hour and a half further. 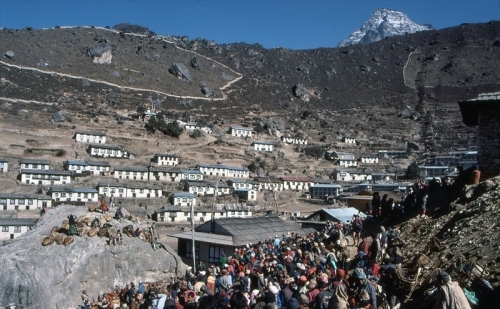 Namche Bazaar is the gateway of Everest Base Camp Trekking, also the main trading center of the Everest region. We stay overnight at guesthouse in Namche. Day 3 :Namche: Acclimatization and Rest Day Acclimatization and Rest Day According to the Health Experts, we need to stay active and moving during the rest days instead of being idle. So, we either spend the day taking a day hike to Thame or visiting Khunde or relaxing and exploring the Namche Bazaar itself. 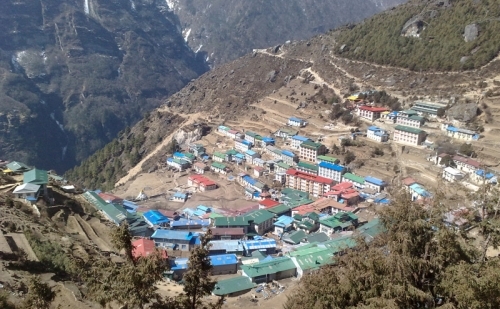 Actually, Namche Bazaar is the main center of the Khumbu Region and has many Government Offices, Internet Cafes, ATMs, Restaurants, Shops and other amenities. Our guides will take you to the Tourist Visitor Center near the Headquarter of Sagarmatha National Park, where you can observe an assortment of things which are related to the First Everest Climbers and Sherpa Culture. You will also get to learn about various flora and fauna in Everest Region. Day 4 :Trek from Namche to Phorse Village (3800m) 5-6 hours Our trail today moves from Namche to Phorse Village and is rather steep, but boasts excellent views over to Phorse and to the spectacular river gorge below including an inaccessible natural rock bridge. We start on a level trail and walk up through the stone steps to reach the Mugla Pass at the altitude of 3975m. 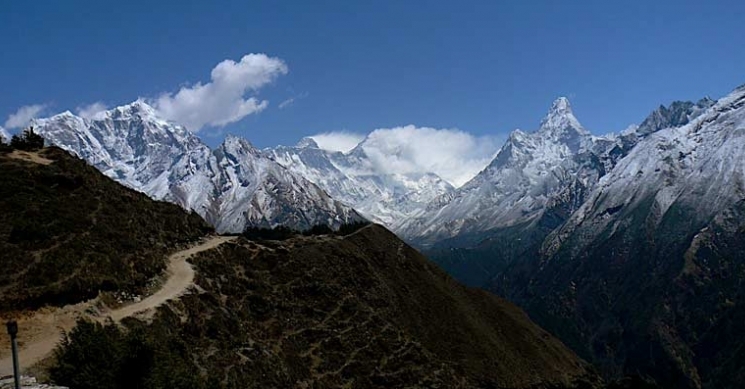 From Mongla Pass, we can witness the beautiful glimpse of Mount Ama Dablam, Mount Khumbila, and Mount Thamserku. Sherpa people regard Mount Khumbila as the sacred mountain of the patron god of the Khumbu area. We descend to the Dudh Koshi Khola and then cross a bridge and again trek up through the rhododendron forest. Eventually, we arrive in the walled fields of Phorse. After a short trek, we arrive at Phorse village where we stay overnight at local guesthouse. Day 5 :Trek from Phorse Village to Dingboche (4360m) 6-7hours We trek down the narrow train through a Monastery from Phorse Village. We then continue our Everest Base Camp Trekking through the lush alpine forests until we reach the large village of Upper Pangboche where we will get astonished by the dramatic views. On the way, we pass through the villages of Shomare and Orsho. Continuing through Tsuro Wog, we trek further up through the Khumbila Khola Valley to the ridge top from where we witness the beautiful views of the soaring mountains of Taboche, Mount Thamserku, Mount Ama Dablama, Mount Nuptse, Mount Cholatse, and Mount Lhotse among others. We can even observe the beautiful Imja Khola Valley to the east. Moving further onwards to the trail, we eventually reach Dingboche. Our accommodation tonight will be at a local guesthouse in Dingboche. Day 6 :Trek from Dingboche to Duglha (4600m) 3-4hours Many people take an acclimatization day in Dingboche and make it to Labuche in one day but we rather suggest you stay Duglha which makes the acclimatization much easier. We start the sixth day of Everest Base Cam Trek with a climb to Dughla through the Khumbu Khola Valley. Our Trekking trail will pass along the dry terrace with some awesome views of surrounding mountains. As we reach Dusa (a yak herders' place), the valley narrows and we have to continue through Phulung Karpo. There's a Chola Lake above Phulung Karpo. As we continue the trek, we witness the majestic views of Mount Pumori (7138m). We ascend to Duglha after crossing a small wooden bridge. We stay overnight at Duglha. Day 7 :Trek from Duglha to Lobuche (4940m) 2-4 hours We have to walk up the steep terminal moraine of the Khumbu Glacier, beyond Duglha. As we ascend to Chupki Lhara, we find our way through the boulder-strewn slope. We find an array of stones with the prayer flags at the top of the ridge. 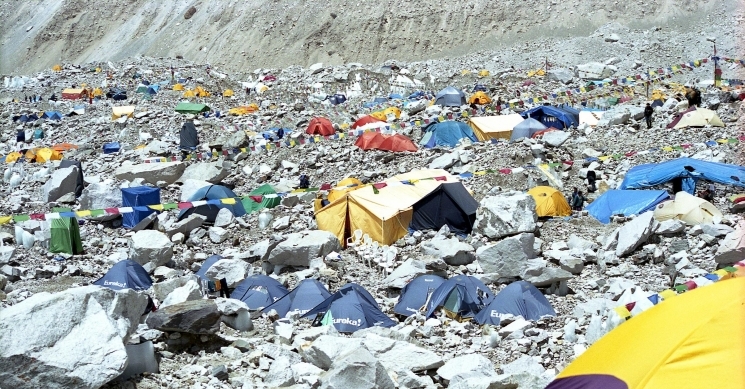 That collection of stones with prayer flags is used as the memorials to American Mountaineer, Scott Fischer and 10-times Everest Summiteer Babu Chhiri Sherpa (Nepali Mountaineer) who perished on a mission to climb the Everest. We can witness the beautiful sights of Mount Khumbutse, Mount Lingtren, Mount Pumori, and Mahalangur while dropping down the Khumbu Glacier. We finally arrive at Lobuche where we stay overnight. Day 8 :Lobuche to Gorakshep (5150m) to EBC to Gorakshep 7-8 hours Today is the main important day of Everest Base Camp Trekking, our trail to Gorakshep goes ahead through the side of the Khumbu Glacier. Our path passes through the pyramid sign post. A small ascent would take us the Thangma Riju from where we can perceive 360 degree vista of snowcapped mountains. As we reach Gorakshep, the surrounding snow capped mountains, including the top of the world welcome us. From Gorakshep, we trek to Everest Base Camp. After having the rewarding views of Mount Everest and other mountains around our site, we return back to Gorakshep where we stay overnight. Day 9 :Gorakshep to Kalapatthar (5545m) to Pheriche (4280m) 7-8 hours Today we will reach the highest point of the Everest Base Camp Trekking trip. So, we make an early start in the morning to catch the dramatic mountain views from Kalapatthar. 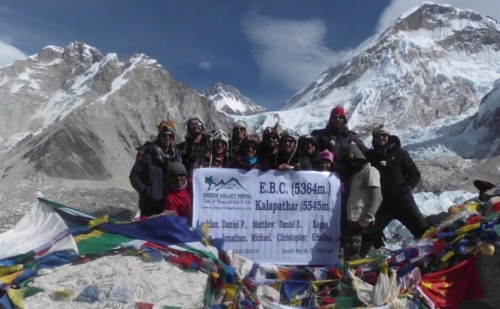 Kalapatthar is considered one of the finest viewpoints in the Everest Base Camp Trekking. 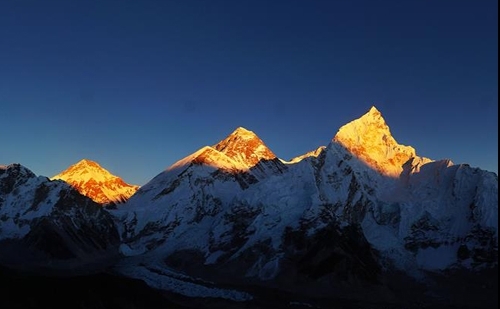 From Kalapatthar, we can observe the first light of the day shining on the glorious Mount Everest. Similarly, the familiar peaks such as Lingtren, Mount Khumbutse, and Mount Changtse among others tower to the east even as Everest begins to reveal itself rising between the west shoulder crest and Nuptse. We can take the pictures of the mountains around us. After spending some hours in Kalapatthar, we descend back to Gorakshep. After having breakfast, we gradually descend down to Pheriche where we stay overnight. Day 10 :Trek from Pheriche to Namche (3440m) 6-7 hours Today is going to be an easy walk down to the lower altitudes. As we follow the same route back to the terminal moraines at Duglha and following the wide valley of Khumbu Khola, now we have to pass through the beautiful Sherpa villages of Pheriche, and Orsho along with Shomare. 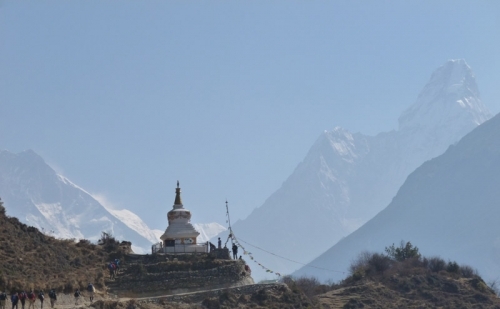 We then reach Pangboche village where we can explore the oldest monastery in the region which contains what is said to be the scalp and bones of repulsive snowman Yeti. We leave the mountains behind us and descend through Tengboche Monastery at the elevation of 3860m before we reach Namche. We stay overnight at guesthouse in Namche. Day 12 :Flight back to Kathmandu Today we fly back to Kathmandu after our long mountain journey. We catch our morning flight from Lukla and after about 35 minutes, we arrive will at Kathmandu. On reaching Kathmandu, you can take your time and rest, or go for last minute shopping.